Recent reports claimed 3-keto-desogestrel to exert less androgen-related side-effects than levonorgestrel. These claims were based on data obtained from receptor assays performed as single determinations. We were prompted to investigate androgenic actions since our own clinical experience with these two progestins did not suggest differences in androgen-related side-effects. In addition, actions of cyproterone acetate (CPA) were studied. Relative binding affinities for the androgen receptor were investigated in cytosol samples of mice kidneys. β-glucuronidase activities were determined in kidneys of adult mice treated subcutaneously with 0.05, 0.5 and 1.5 mg of progestational agents for 7 days. RBA for the androgen receptor of DOG, LNg and CPA were 0.316 ± 0.092, 0.195 ± 0.053 and 0.204 ± 0.022, respectively, as registered in seven different experiments. Statistical analysis of data revealed significantly greater RBA for DOG than for LNg (p < 0.02). No differences in β-glucuronidase activities between DOG and LNg were noted for 0.05 and 0.5mg doses whereas a significantly greater enzyme stimulation by DOG was registered for the 1.5mg dose (p< 0.005). CPA was found to exert synandrogenic action on β-glucuronidase activities at the lower dose level and antiandrogenic action at the higher dose levels. 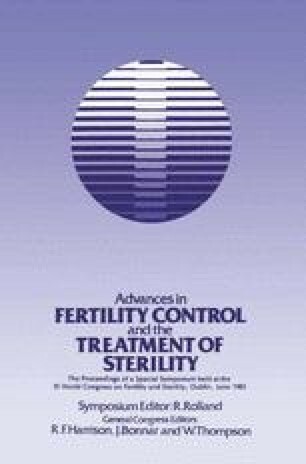 The present data suggest that 3-keto-desogestrel exerts more pronounced androgenic actions on target tissues than levonorgestrel. Clinical data indicate no greater differences in andro-gen-related side-effects between oral contraceptives with 3-keto-desogestrel or levonorgestrel.